Posted by admin in How to Tweeze Your Eyebrows? Overgrown eyebrow hair can be minutely and neatly removed with the help of tweezers. Though a painful procedure, one can permanently get rid of the bushy eyebrows by employing safe and simple techniques of tweezing. 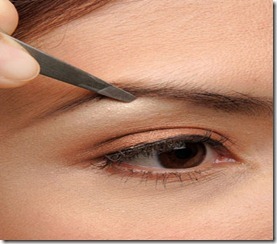 Find out more about plucking your messy eyebrows with tweezers by reading the following article. 1. Pick a natural light source for your tweezing. 2. Place a warm washcloth over brows for 5 – 10 minutes. 3. Exfoliate brow with a washcloth to help free up any (potential) ingrown hairs. 4. Pull skin taut and remove offending hairs as close to the root as you can AND in the direction of the growth. 5. Close pores with an astringent when you have completed the session. Tweezing or snipping should be done weekly. Attempting to accomplish the entire brow in one sitting will likely lead to mistakes. Teething gel for babies can be used to deaden the pain if you find tweezing very uncomfortable. Avoid tweezing (if possible) around menstruation. It simply hurts more at this time.